Okay. 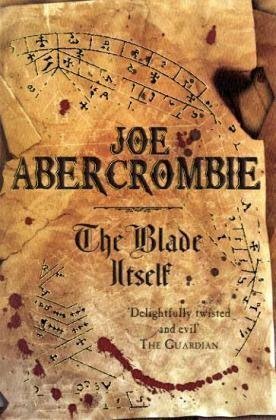 Here's what I think about Joe Abercrombie (although this may have changed, as I haven't read him for a while): he writes one book, or at least one kind of book. He is basically the king of grimdark and that's his deal. So: expect nasty. Expect stylishly gleefully nasty. Not necessarily gratuitously so but these are books where bad things happen to people, people aren't very nice to each other, and the usual sort of things we're supposed to believe in (morality, virtue, selflessness) are usually proven to be either hollow, hypocritical or in service to or inadequate against immorality, inequity and selfishness. He is, however, less rapey than GRRM. Basically these books have a kind of Chaucerian morality to them: the punished are, most often, the stupid. Or at least the unadapting. He also has a vivid, non-hight-falutin' style that excels at swearing, dialogue and really excellent action sequences. Lest I've made this sound depressing, it's actually rather playful, it's characters--though basically terrible people--are easy to root for (especially Glokta - the broken Inquisitor) and there is a certain, err, grimdark satisfaction in its dark cycles of temporary power and inevitable powerlessness. Highly recommended for them as like that sort of thing. And while I am generally tired of grimdark, there's no denying that Abecrombie is one of its masters. Sign into Goodreads to see if any of your friends have read The Blade Itself. While I am generally tired of fluffy ;-) and realising a liking to the darker stuff, you're review makes me a bit wary... But you've got me intrigued, too. Could you elaborate on the less rapey? I don't mind if you spoiler me. Also, is there on-page religious/cult/or similar oppression of people? Because I realised this is one of my few hard limits. I couldn't continue with The Rifter Series for that reason, unfortunately. I soooo bloody love this book! I read it and then listened to the audio-book, which is brilliant - Glokta's voice and the lisping, done just right! I agree, Alexis - Abercrombie is the master of dialogue. Also, excellent battle scenes and sword fighting. I wonder...did you enjoy the fencing, Alexis? I enjoyed the first book quite a lot (including Glokta! ), but did not finish the second. Not because of a difference in the good and bad qualities, but it felt like we weren't making much progress in story. You're the second person I know to call GRRM "rapey". I want to read the books, but I wish that weren't something so many people say about them. Puts me off.